Pogo sticks have been around for nearly 100 years. 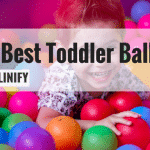 They’re a great way to get your family active – kids and adults included. They’re an ageless pastime, and they’ve certainly come a long way from their original wooden design. Now, pogo sticks come with all kinds of neat features. Whether you’re a kid or just a kid at heart, there’s a pogo stick for you. Children should always wear the appropriate safety gear when jumping on a pogo stuck, and be supervised by an adult when jumping. Make sure you’re purchasing a pogo stick that’s designed for the age and weight of your child, and consider the additional safety features your child may need. If your child wants a pogo stick but you believe he or she is too young to safely enjoy one, The Grow-to-Pro is your best alternative. 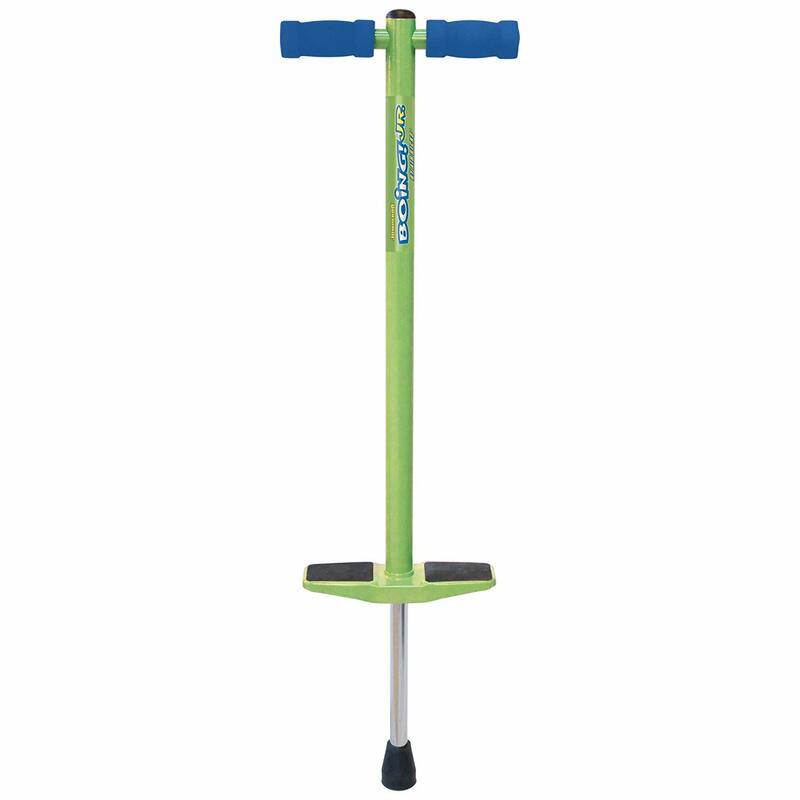 This is a training pogo stick that comes with some additional safety features that can help children learn. The base features a removable wide stand that assists children in learning proper balance. As they become comfortable on the pogo stick, the larger base can be removed to reveal the traditional rubber foot. ​Gives little ones an opportunity to safely learn, minimizing the risk of injury when used with a helmet, elbow pads, and knee pads. ​Smaller size is easier to smaller bodies to use. ​Larger foot pedals and foam padded handles make this pogo stick easier to use. ​Children will eventually outgrow this pogo stick. 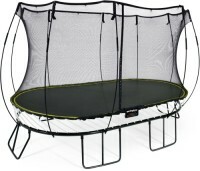 It’s designed for younger jumpers, so older kids and teens won’t be able to use it. ​Even though this pogo stick is designed for maximum safety, it still should be used by children wearing full safety gear. For parents who hold safety as a main concern, this pogo tick wins out. 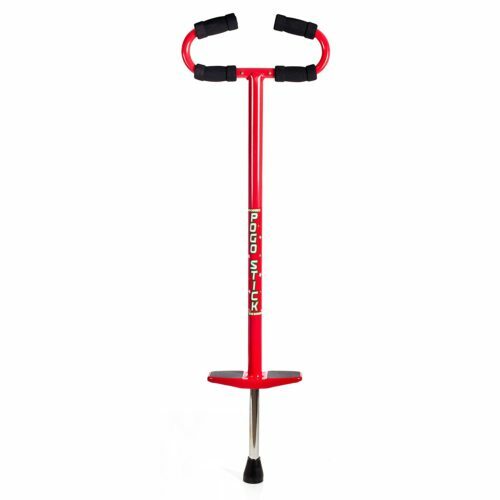 This is a pogo stick for kids ages 6 and up who weigh between 50 and 90 pounds. It’s intended to be safe and comfortable for young ones, but it isn’t loaded with exorbitant safety features like many pogo sticks that are designed for children just exiting the toddler phase. Foam padded grips and a light weight make it easy for small hands to hold on and bounce. ​Four different hand grip positions accommodate children of any height. ​Pogo stick is lightweight, so children can carry it around on their own. This is convenient for outings at parks or playgrounds. ​Foot pedals are wide, designed to fully support a child’s shoe and providing little to no slip room. ​Since the weight limit tops out at 90 pounds, older kids won’t be able to use this pogo stick. ​Only comes in one color. This is great pogo stick for younger kids who already have some athletic skill. 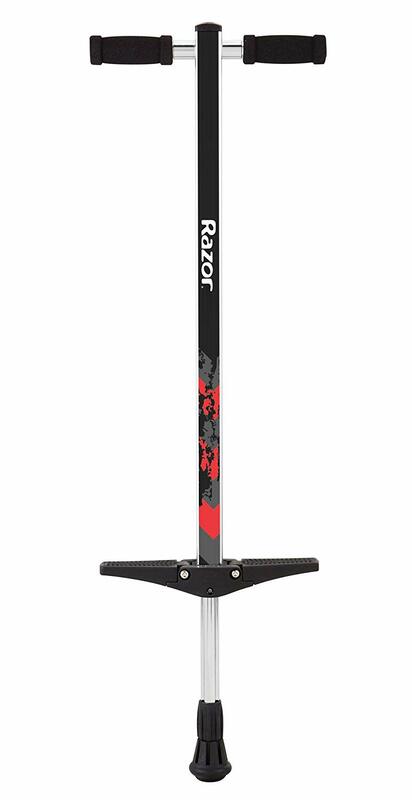 If your child is good at riding a bike or jumping on a trampoline, they’ll most likely be able to handle this pogo stick with ease. Wearing the proper safety gear and jumping in safe environments is always recommended, though the adjustable grips and wide foot pads make this pogo stick a little safer than others. ​This pogo stick looks a lot like the retro models that came out in decades past. 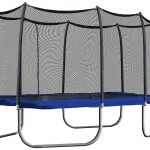 It’s designed for kids 7 and up, and can hold between 70 and 110 pounds safely. It’s ready to use right out of the box, and the handle comes with four adjustable grips that are easy to flip. Taller kids can use it just as well as shorter kids simply by switching grips. ​Pogo stick’s weight limit goes up to 110 pounds, so young teens can enjoy it. ​The dual position hand grips make it just as safe and easy to use for a young child as a young teen. 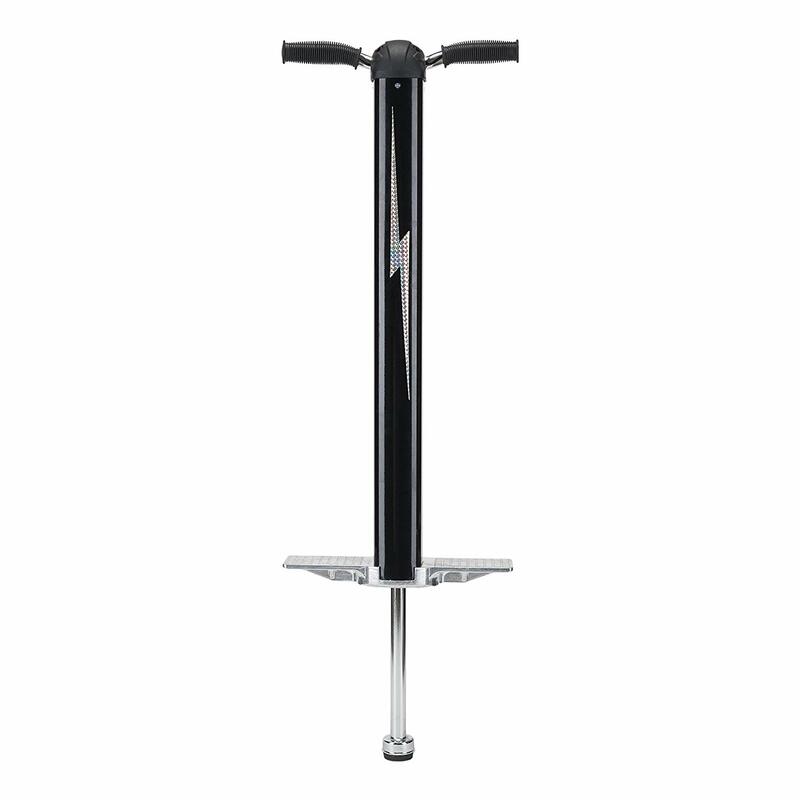 ​Pogo stick is one solid piece, requiring no assembly or adjustment other than the grip position. ​Since the lower end of the weight limit is 70 pounds, very small children may not be able to use this pogo stick. ​This is perfect pogo stick for kids in middle school. The higher weight capacity makes it safer and more efficient for older jumpers, and the hand grips are easy to adjust for maximum control. Even the height is adjustable from 40 inches to 45 inches, and these adjustments make all the difference when dealing with growing children. They’ll be able to use this pogo stick for longer than smaller models. ​Razor is one of the leading manufacturer for youth sports equipment, known for their innovation. This pogo stick showcases exactly what their innovations can do. This is a foldable pogo stick that’s easy to transport and store. The lightweight aluminum frame and collapsing design make it easy for you to take with you. 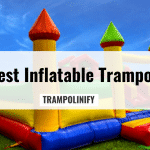 Kids can bring this to their friends’ houses and everyone can bounce together. ​Convenient, portable, space saving design. ​Extra rubberized foot for maximum shock absorption. ​Maximum weight capacity of 140 pounds means that your kids won’t outgrow this pogo stick, and can technically use it into their teen years. 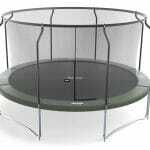 ​Since the maximum weight limit is so high, younger children may have a hard time bouncing high due to the stronger springs. ​This is the best pogo stick for kids who need to be able to travel with their pogo stick. 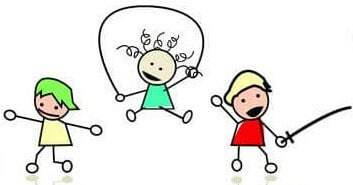 If they often take their toys, games, or activities to different places with them. The handles and steps fold down, making it easier to transport the pogo stick. This also makes the pogo stick easier to store when not in use, helping it easily fit under a bed or in a closet. ​Flybar essentially invented the pogo stick, and by looking at their design, you can tell. Flybar features corrugated spring covers that are fun to look at, foam padded grips, wide foot pedals, and an extra wide foot for better stability. 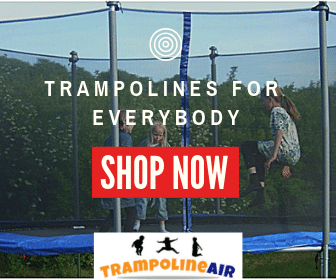 Their signature model comes in 7 colors, making this an excellent choice for families with multiple children who need to be able to tell their pogo sticks apart. ​Flybar has been making pogo sticks for almost 100 years. Though their pogo sticks are a little more expensive than their competitors, you’re paying for innovation and quality that can’t be beaten. ​This pogo stick is designed for tricks, making it perfect for rugged riders. ​The upper end of the weight limit is 160 pounds, so you’ll never have to worry about your child outgrowing it. 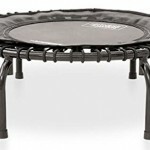 ​The low end of the weight capacity is 80 pounds, so younger kids may not be able to get a good bounce. ​This is high performance pogo stick for kids in their teen years. 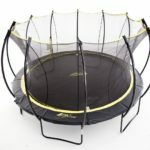 It’s designed for children who are already comfortable doing jumps and tricks, and the weight limit figures in maximum safety for teenagers. Pogo sticks aren’t just for kids. Adults can use them to get healthy and active in the same way. Some adults even learn tricks and competitively jump – a popular sport on college campuses. Since children’s pogo sticks aren’t intended to withstand rough use or high weights, you’ll want to splurge for an adult model that’s built to handle you. ​The Super Pogo 2 is designed a lot like a traditional pogo stick, and is great for adults who want to recapture the nostalgia of their childhoods. It’s made of aircraft grade aluminum, and the foot grips, handle grips, and rubber tip on the foot are all replaceable. It comes ready to use – all you need to do is rotate the handlebars to a position that will work for you. ​Designed for ages 14 and up, with a weight capacity of between 90 and 200 pounds. ​Designed to be durable enough for high, hard bounces. Adults can do tricks on this pogo stick. ​Since the foam and rubber parts are replaceable, it’s easy to maintain this pogo stick and help it last for years to come. ​Weight limit caps out at 200 pounds, so larger adults may not be able to use this pogo stick. ​This is the best pogo stick for adults who miss the one they used to have as a child. It’s designed the same way, but modified to fit today’s standards and utilize modern technology. This is a no frills, durable adult pogo stick for a reasonable price. ​This is a pogo stick designed for both kids and adults. It’s both lightweight and durable, designed to outlast the competitors at the same price point. The foot plates are welded, the body is steel, and the low friction springs are quieter than others. The grips are optimal for tricks, such as stick flips. It even comes in 4 different colors. ​Pogo stick is designed to be quieter, so the bouncing noises won’t disturb your neighbors. ​Welded foot plates make it safe to test the pogo stick’s limits. You don’t need to worry about cracking any plastic or knocking components loose. ​Maximum weight limit is 180 pounds, so larger adults may not be able to use this pogo stick. ​This is great pogo stick for adults on a budget. It’s closer to the price of a child’s pogo stick, but still designed to support higher weights and vigorous use. The quiet spring is also a huge bonus for people who can’t stand the loud sound that pogo sticks sometimes make. ​This pogo stick is designed for serious athletes, specifically meant to cater to older teens and adults. The coated industrial spring is actually visible on the frame. The tip is nitrile rubber, which is one of the most durable materials available. 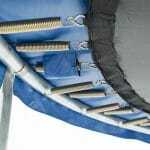 It’s made of heavier metal that’s designed to withstand rough use, and the steps and clamps are reinforced. 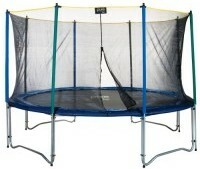 ​Weight limit goes up to 210 pounds, which is the higher than most pogo sticks in this price range. ​Taller height is easier for adults to use. ​Feet are made of plastic instead of metal, which makes them more prone to cosmetic wear and tear. ​Exposed industrial spring is louder than other pogo sticks. ​This is good pogo stick for adults who really love getting active. If you want to use a pogo stick as a fitness tool, or even as a competitive hobby, this pogo stick will stand up to whatever you put it through. It’s a little more on the expensive side, but you’re paying for quality. 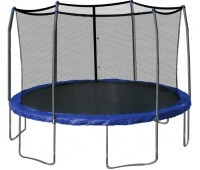 It’s a great option for adults who weigh a little over 200 pounds, since higher weight limits are difficult to find. ​This pogo stick is unlike anything you’ve ever seen before. It’s made with nearly futuristic technology, and the nylon air piston system gives it come astounding capabilities. This pogo stick can handle weights up to 400 pounds, and it’s the only one on the market with such a high limit. Everyone from young children to large adults can use this pogo stick, but it’s the adults who ought to be the most excited. ​The weight limit is absolutely unbeatable. 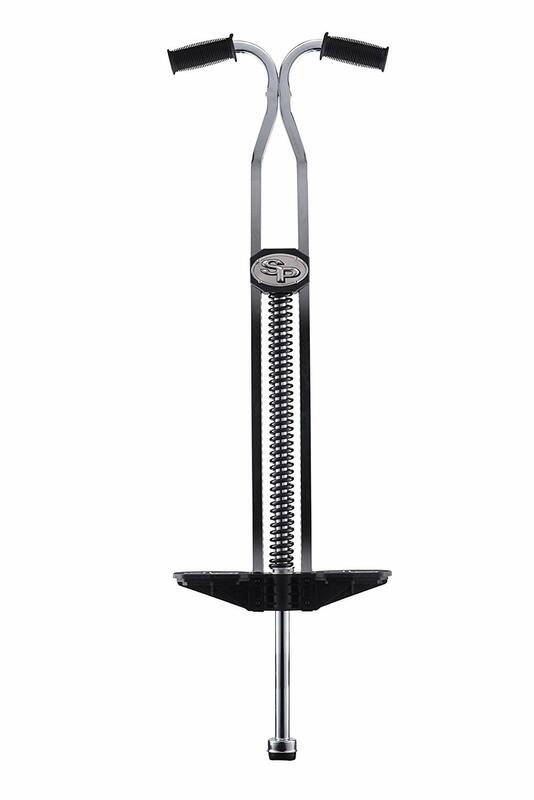 You won’t find another pogo stick that can accommodate up to 400 pounds. ​The grip tip is designed to minimize rebound and provide better traction, making hard bounces a little safer. This pogo stick requires an air pump to set the right pressure. It’s a little inconvenient, but not necessarily difficult. ​It is one of the most expensive pogo sticks on the market, though it is undoubtedly the most durable. 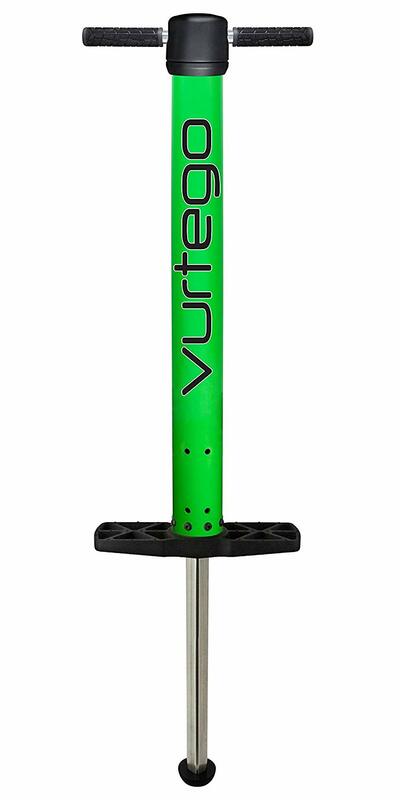 ​This is good pogo stick for adults who weigh more than 200 pounds, or adults who require a pogo stick that’s virtually unbreakable. You’re paying a higher price, but you get what you pay for. If you shop for quality and need something indestructible, the Vurtego V4 is absolutely your best choice. When selecting a pogo stick, the weight limits and durability are the two most important things to consider. So step on the scale to determine your weight, and think about how you intend to use this pogo stick. There are a few considerations you’ll need to make, but it’s worth double checking to make sure your investment is worthwhile.